make use of the MOBI structure. These .mobi files specifically work on low-bandwidth mobile devices. are adding your pages to the book, creating highlights, bookmarks, free hand drawings, etc. It also contains a dictionary. Download app FBReader from play store and install it. Note down where in your phone is your MOBI file located. For example storage/SD card/downloads. After this go to the FBReader app and open it. On the main screen of the app, press the button of your phone which you use to navigate back. Then click on Open Library which will take you to app's main library. Click on File Tree and select the directory where you have stored your mobi file. Choose Memory Card option if your MOBI file is on the SD card or else click on Device if it is in phone storage. Select your desired MOBI file. Go to the top right side of the screen. Click on read button and start reading your .mobi file. Go to Play Store and download Kindle for Android and install it. Go to your phone's file manager or file explorer. Note down where in your file manager is your desired MOBI file stored. Copy and paste that MOBI file to the Kindle folder. You can locate the Kindle folder under the parent folder directory of either Storage/SD card or Storage/phone storage. After pasting it to Kindle folder, close the file manager. Open Kindle app and go to its Menu and click on the option Sync. Now you can see your desired .mobi file in the menu. Open your file and start reading. Download the app eReader Prestigio from Google Play Store and install it. 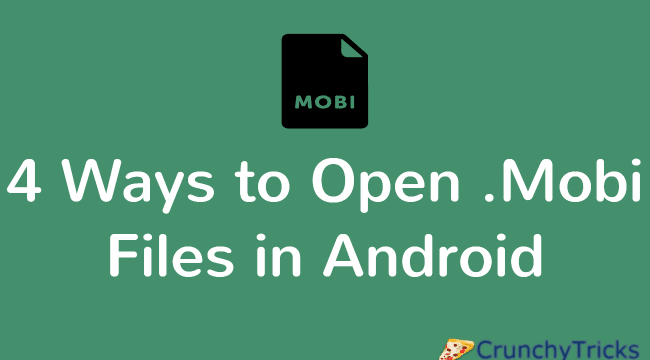 Locate where in your Android device is the MOBI file stored. Then open the eReader Prestigio Book Reader app. Tap on the top left corner to open the menu button and then click on the option File. It, in turn, will open up your file manager or file explorer. Go to the folder where your mobi eBook is located. Tap on the file to open it and enjoy reading your MOBI file. Download the app Cool Reader from Google Play Store and install it. Locate where your MOBI file is in the file explorer. Open the app Cool Reader. On the main screen, you will find many icons. Tap on the icon below the heading Browse File System. It will open your File Manager. Navigate to the folder where the MOBI file is stored and tap on it. The app will open up your MOBI eBook, and you can start reading it on your Android device. So, go on try any of the methods as mentioned above to open your desired .mobi file on your Android device.